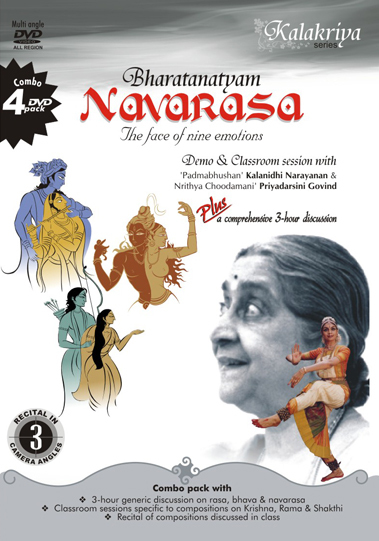 This 4 DVD pack treats us to the delights of navarasa by way of an engaging and elucidating discussion between 'Padmabhushan' Kalanidhi Narayanan ('Maami' to her students) and her student Priyadarsini Govind covering the generic aspects of navarasa. This is followed by a classroom session where 'Maami' deals with the specifics with 4 compositions- two on Krishna, one on Shakthi and Rama each! To crown it all, Priyadarsini comes up with a breezy performance of these compositions. The First DVD, available only in this combo pack, is a unique value addition that contains a 3-hour freewheeling discussion between the duo that meanders through the aesthetics of and approach to navarasa. Here 'Maami', spurred by her quizzical student, throws open the floodgates of her wisdom accumulated over six decades. The viewer gets a wealth of information straddling rasa, bhava and the subtle differences between the two. How srungara, as an emotion, is commodious enough for the portrayal of other rasas, the convergence of vatsalya and bhakthi with srungara, the importance of understanding the meaning of the composition and mood of the composer, the critical significance of sthayi bhava, vibachari bhava and anu bhava in navarasa portrayal, the most preferred position that an artiste should take to ensure better visibility of the emotions expressed â€“ all these aspects come out with a telling clarity. DVD 2 - Classroom session on two compositions on Krishna & Priyadarsini's performance of the same. 'Atheeram alokitham'-in Ragamalika a Bilvamangal composition from Krishna Karnamritam presents little snapshots of Krishna describing his sweet talk, manly gait, intoxicating caress and charming smile. 'Mallesa shylendra'-in Ragamalika unfolds a collage of images as child Krishna enters the wrestling arena to take on the wrestlers set up on him by Kamsa. DVD 3 - Classroom session on a composition on Rama & Priyadarsini's performance. 'Srungaram Siti Nandiney' in Ragamalika explains the multiple emotions Rama is subjected to in different situations. DVD 4 - Classroom session on a composition on Shakthi & Priaydarsini's performance. 'Shive shrungarartra' Ragamalika describes the myriad emotions stirred in Goddess Shakthi by the adventures and attributes of Shiva. An aesthetic fare dished out by a revered guru in the company of her celebrated disciple! DVD's 2,3 &4 are also available as individual products.